2003 M.F.A. in Painting from I.K.S.V.V. Khairagarh. 1999 B.V.A. in Painting from Govt.College of Arts and Crafts, Kolkata. 2002 Certificate of Merit from Rashtriya Kalidas Academy, Ujjain. 2002 Camlin, West Zone Student Award. 1999 Certificate of Merit from Govt. College of Arts and Crafts, Kolkata. 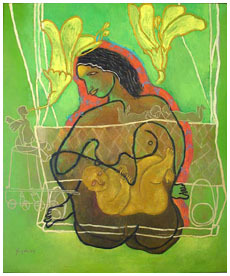 2007,06 Birla Academy of Fine Arts, Kolkata. 2006 Academy of Fine Arts, Kolkata. 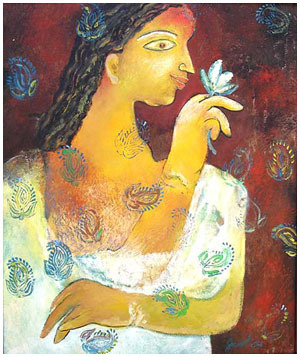 2004 Birla Academy of Fine Arts, Kolkata. 2002 Rashtriya Kalidas Academy, Ujjain. 2002 College Annual Exhabition, Khairagarh. 1999,98,97,96 College Annual Exibition, Kolkata.